Feed a low carb, high protein diet. Science Diet M/D and Purina DM formulas are excellent, readily available options. 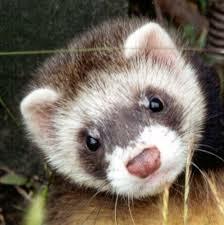 Ferrets are carnivorous, like cats. As carnivores, they need a very high protein diet and can’t process carbohydrates as well as omnivores (species intended to eat a variety of food sources). Ferrets’ pancreatic cells have to produce more insulin than they are intended to in order to process the excess carbohydrates that are provided in many foods. Over time (just a few years) those hyperactive cells become “hyperplastic”. This “hyperplasia” progresses to abnormal cancer cell development. Pancreatic tumors (Insulinomas) produce WAY too much insulin, which causes a condition opposite to diabetes: hypOglycemia. Hypoglycemia in ferrets can cause lethargy, depression, vomiting, hypersalivation, grinding of the teeth (‘bruxism”), seizures, coma and potentially death. Emergency treatment is Karo syrup rubbed on the gums. In the hospital, ferrets are treated with IV dextrose and fluids for shock, if needed. Surgical removal of the tumor (s) is necessary for cure. The bad news is that more tumors usually develop over time resulting in recurrence of symptoms. Minimizing the carbs, by feeding a low carbohydrate, high protein diet is the key to prevention! Prescription foods formulated for diabetic cats are the most readily available diets that fit the bill. Ask your vet for Science Diet M/D our Purina’s DM formulas.